Fantastic Franklin or a Terrible Trevor? Take a deep breath, relax, compose yourselves. GTA V is just hours away and the long-awaited verdicts are finally in. It's been an excruciating wait since that first teaser broke in November 2011. Little did we know back then that we'd be getting not one protagonist this time, but three. 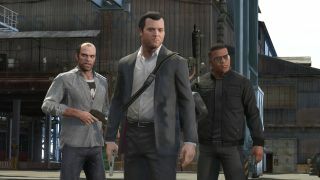 And the surprises kept on coming: just last month we discovered that 5 would give birth to an entirely separate online component, Grand Theft Auto Online, which launches on October 1. So what's the ruling? "Whether you're in the thick of a bank heist or exploring the wilderness listening to Johnny Cash on the country station, it always feels tight, refined, and polished," said CVG. Go read the full-blown review right over here.